Dalamud Popoto Sets or just regular Popoto Sets? Did one plot with Althyk lavender alternated with prickly pineapple and another plot with Althyk lavender alternated with old world fig. 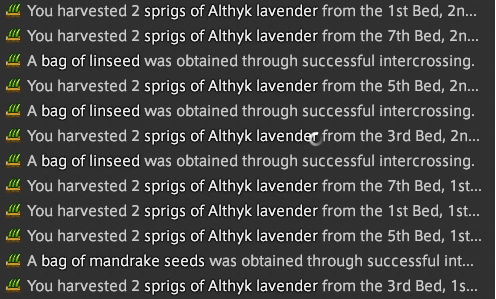 Just pulled more Althyk lavender i crossed with the normal popoto sets and got Ala Mhigan Mustard seeds. Has anyone tried the XXXlight seeds in higher grade soils yet? I've just grown two lots (fire & ice) in the plant pots with G1 Last Noscean soil & they give 50 shards in around 48hrs. I'm wondering if it's possible to get crystals other clusters using La Noscean soil or possibly 100 or 150 shards with Shroud soil. If so, getting a decent amount of shards for little investment is appealing to me. I planted one of each using G3 Shroud tonight. I'm curious what the yield will be, I may try G3 Than for intercross next. ONLY Chives seeds all the time. I had been using Midland Cabbage + Blood Peppers since the Peppers exist and not a single time I had ever got something different from Chives Seeds. Idk why you're quoting an oldass post, but yes, I did get that result. However in the x months since then I've only gotten chives, so I have no explanation. From the ___light seeds, I got 100 shards from Shroud 3, 50 from Thanlan 3 (no crosses seem possible). 48 growth period to maturity. I see some of the seeds up on the market board on my server, though unless those are really low and you're stocked up on soils, I don't think they're worth much unless shards are very expensive on your server for some reason. The seeds themselves are the old hidden/single gather ones and you can't get them via retainers either, so they don't seem worth the costs that you have to invest in them between time/RNG/soils. Especially when you can just send retainers out on a venture to collect 60 every 40 min (or something that sells for enough to buy even more crystals)! I was hoping for at least 300 or so crystals for that kind of time to mature. 30 shards per venture but like it has been said, it depends on the value on the server, if you have time to gather & if you need your retainers for something else. On Leviathan some shards/crystals/clusters are obscenely expensive at times so if I'm not using my garden for anything else then only having to tend the garden twice for possibly 800 shards is a boon. I'm not sure if anyone collects this data. Just harvested some oldrose planted with G3 Shroud. I used 1 Blue, 1 Yellow, 1 Red Pomace (in that order) on each of them at the same time. Harvested 2 Black, 2 White, 2 Red, and another 2 White. Further evidence the outcome is RNG and not by a pattern of fertilizer used.